I've been thinking a lot lately about the unintended negative consequences of it, and particularly how these relate to our current political situation and the future of both funding for the arts and of what types of projects get support. We build our society and our future with little decisions. We tend to make them quickly and just focus on the novelty of new mechanisms, instead of thinking about their bigger implications. This critique isn't a thesis, but rather my initial thoughts on the subject. On the face of it, Kickstarter is pretty harmless, and I think the founder's intentions are good. It's great that people can raise money for cool things from the crowd. It's hard to raise money, especially for the arts, and there have always been a lot of gatekeepers in the way. Now, the people can decide what gets funded. I fear, however, that this particular phenomenon fits a little too squarely with the right-wing agenda in the US (and elsewhere, actually). Government support for the arts has always been miniscule, but it's now disappearing rapidly, with many states moving to cut their state arts commissions and one that already has. This year, we saw more attacks on the NEA, CPB and other public funding for media and the arts. Yes, crowdfunding helps bridge the increasing gap, but I'd be much more excited if I received calls to action to support public funding for the arts every five minutes, instead of another email announcing a Kickstarter campaign I can help fund. Why should I need to help fund some filmmaker I love, when I pay taxes that I believe should support the arts, but don't. This smacks of the "big society" ideas going around in the UK to me. The government doesn't need to help the people anymore, the people can help the people. While contributing to a Kickstarter campaign doesn't make you a right-wing, arts-cutting person, by any means, the adoption of such trends can be detrimental to the argument for public funding of the arts. Now, I'm not sure that's such a bad thing, to play devil's advocate. Heck, the State Arts Agencies are probably a lost cause, and the NEA hasn't been very effective (although their new leadership is trying hard). A crowdfunding system is better than no system at all, and I've seen multiple projects raise more money in less time through Kickstarter than the average government grant. But I'm also weary of some other things this trend reinforces. Funders who have already determined that they don't need to fund production and distribution, because anyone can shoot a film for cheap and give it away on YouTube, who now also add that it's easy to fund a movie, so why should they? Trust me, I've heard these arguments already. Funders who understand that good films can be expensive to make and distribute, but who think that you should show them a successful crowdfunding campaign, to show community support. I'm all for the power of the audience, but some art isn't necessarily popular, and making it a popularity contest won't make better, or more effective, art. Funders who don't know anything about any of this, but they smell a trendy subject easily, and are easily swayed. Many of these are now asking how your campaign went, even though they've never even looked at Kickstarter. My biggest concern, however is this - guess who usually gets help when the people help the people? The rich and connected people. That's who. They've traditionally been the ones able to make indie films, by the way, even though people don't like to talk about it. This isn't exclusively true, of course, but it tends to be true - filmmaking has been a rich person's game for most of its history. In addition, the doc community is nothing if not an insider's clique, and Kickstarter isn't changing that much. There's a big danger, and it's a very likely scenario, that we'll just get more of the same in terms of what and who gets funded. Take a look at who you hear from and support on Kickstarter. Unless you are an exceptional scout, I'm willing to bet the list is disproportionately Western, White and middle-class or above. Take a look at the most funded projects on Kickstarter, again it appears (from an unscientific survey) to hold up these assumptions. Perhaps this will change. Perhaps I am wrong. Perhaps we'll live in a crowd-funded world in the future and it won't look like this. I'm not so sure. Are you? I, for one, would like to see things mature to something different - government funding for the arts, that is accountable to, open to and influenced by the people. Perhaps augmented by the crowd, but not solely supported by it. Diverse in both projects funded and who funds them. In the meantime, I'll keep supporting the projects I love on Kickstarter. Perhaps someone will start a Kickstarter campaign to build an arts agency that takes the place of the NEA someday. I'll contribute to that too! I spammed/emailed this to my friends earlier today, and thought I'd share it with you here. I'm writing to tell you that the film "General Orders No 9" by Bob Persons opens this Friday, June 24 at the Rerun Theater in Dumbo, Brooklyn. Kohler was correct - filmmaker Bob Persons is not a film-school educated filmmaker. Instead, he attended the Double Take Documentary Film Festival (precursor to Full Frame) as a spectator with no knowledge of the history of the form and became enamored with documentary film. He decided he needed to become a documentary filmmaker and taught himself how to shoot a digital camera, and learned the history of film by renting nearly every film at Atlanta’s Movies Worth Seeing video store (an amazingly well-curated video store, still thriving in this age of Netflix). As I said to Bob after his first screening, he then went out and made a masterpiece. Since that time, he's won many awards for the film, and he's now working with Variance Films to release the film nationally. The film opens June 24th, this Friday, at the Rerun Theater in Dumbo, Brooklyn. It's a great venue, with craft beers, full bar and excellent food available in the theater (that's right, in the actual movie theater, while you watch). There will be live music accompaniment by the film's composer, Chris Hoke, with the Sunday matinee show (June 26, 2pm) which is not to be missed. The film is currently scheduled through June 30th, but it might be extended if it does well. As many of you know, the film's stay at the theaters, and how many it eventually plays, is based upon how it does during this first week. We hope to open in Manhattan, and then in many other cities (some are already booked, like Savannah, Denver and Dallas), but the odds will improve greatly if you buy tickets and see the film, and if you tell your friends who live in NYC to do the same. I'm helping arrange Bob's DVD, VOD and other digital sales soon after the theatrical tour of the film, and we'll announce their availability on the film's website, but trust me, you want to see this on the big screen. For those of you so inclined, please tell your friends to follow the film on Twitter and Facebook, and please help spread the word. You can watch the trailer here, check out the awesome movie poster here (hint: not only is it for sale, but some cool art from the film will be available for sale soon) and again, buy tickets here. Bob will be here for the Q&A after the Friday and opening weekend shows. As many of you know, I've been helping out a filmmaker I know (Bob Persons) with the hybrid distribution plans for his film, General Orders No 9. Well, I'm happy to report that Variance is taking the film out starting June 24th at the Rerun Theater in Brooklyn. It will then tour to many cities and come out on DVD, VOD and all those other mechanisms not long after that. The trailer just went live on iTunes and it is a beaut. I didn't help in the editing, so I can honestly say it is one of the better trailers I've seen for an indie doc in quite some time. I recommend you check it out. For some reason, Apple doesn't let you embed the trailer so you have to click the link. Dumb, but so is the fact that their Twitter button doesn't work right now. Seriously. Makes you feel better about your grasp of tech doesn't it! And what's with this Malick-y thing? One of the reviews of the film mentioned that it made Malick look like a regular ol Hollywood guy. We didn't ask him to say that, but it's true. I'm just back from the fabulous DocAviv Film Festival. This was my first trip to Israel, and I wish I could've stayed longer. I met wonderful people, saw some great films as part of the International Jury, went to the beach (a lot), visited many of the famous sites and learned a lot. While DocAviv takes place during Cannes, that doesn't matter much to the locals, who are coming out in droves, filling the theaters and having a great time watching some amazing docs. We awarded two prizes. The first was a Special Jury Mention to the film Darwin, by Nick Brandestini. He's off to Karlovy Vary next, and you can check out the film here. We also awarded the International Competition Award to El Sicario: Room 164 by Gianfranco Rosi. Turns out El Sicario was recently picked up and will play NYC and elsewhere soon. I highly recommend both films as well as all of the others in competition. There was also an Israeli Doc competition (with many great films, Israeli docs are in their prime right now) and student film awards, as well as a DocChallenge and many special events (including my favorite: Food and Film). The festival is only 13 years old now (happy Bar Mitzvah), but is growing in importance and stature and I highly recommend that doc makers, industry and fans check it out. You can't get much better than May in Tel Aviv, with good docs, good conversations and outdoor screenings at the Tel Aviv Port! While there, I also ran a workshop with Hypermedia on the Future of the Doc, called "Re:Invent." It was a full day workshop broken into three sessions: new business models for distribution and audience engagement, transmedia practices and pitching. I learned a lot from the audience - about particularities of Israeli cinema and possibilities, about new ideas and I hope I left behind some wisdom as well. The biggest things I learned are: 1. that Israeli Docs are great, the scene is vibrant and winning awards (this I knew, but learned even more while there, watching about 15 recent docs) and 2. that there's a pretty solid funding system in place, but not much for trying new models of outreach and distribution, and last 3. that the political situation makes many things difficult for Israeli filmmakers both at home and abroad (in many ways, and from many different perspectives, too much to cover here). There were two interviews that ran in conjunction. One at NRG, and you can see a Google Translation here, and one with DocMovies. Speaking of DocMovies, they have launched a really cool distribution service that is very filmmaker friendly, and I hope to cover more about that soon. I've uploaded the slides from my workshop to SlideShare. Feel free to download them, and use them as you wish. I hope to give more updates from the festival soon. I'm finally settled into the new apartment, and have found the buried computer cables. No, I didn't go completely offline thanks to my Android, but I am not much into typing the blog from my phone. While the rest of the film industry preps for Cannes, I'm now busy with a few filmmaker clients and with preparing for my next masterclass/workshop in conjunction with the DocAviv Film Festival, scheduled for May 18, 2011. I'm working with Hypermedia to put on a full day workshop on the future of the Documentary. Here's the English version of the description and you can find the Hebrew version here or here. If you are in Tel Aviv, register and/or stop by and say hello, and tell your friends who might live there. While I hope to offer some new insights into the possible future of the doc, I'm really looking forward to learning from the audience how the film industry there sees the future, because their doc community is pretty strong and vibrant. Why try to predict the future when you can simply invent it? Digital technology, new business models and a plethora of innovative production and creative tools – all these are combined together and promise many exciting years of research and challenges in the realms of documentary filmmaking. What are the possible directions in the field? Where do we go from here? How do we find the path to success in the new world? This practical all-day seminar will lead the participants into the future districts of the field and provide filmmakers with a concrete, practical and up-to-date tool kit for turning an era of change into an era of new opportunities. Content editor and producer: Ari Davidovich. Fee required, please register in advance. While I've never been a daily updater, I've been better about posting lately...until this week. My personal life has intruded as my wife and I move our apartment this week to a new neighborhood - which is a good (great) thing, but packing is killing my computer time. Which is also a good thing! Back with more soon. Image via WikipediaHelen Hill was a great filmmaker (among many other talents) who was murdered in 2007 in the aftermath of Hurricane Katrina. She was also an acquaintance, and because of that I've been following the progress of her husband Paul Gailiunas as he has been completing her final film. He's done, the film is now touring. There's a grand, big showing in Columbia, SC on April 16th - Helen was from SC and that's where we first met. Here's a note from Paul about the film. If you live anywhere near SC, I highly recommend making the road trip for this special evening. "This is to announce that The Florestine Collection, the film Helen Hill started in 2001, has been finished and will have its first two screenings very soon. Helen began this project after she found more than 100 handsewn dresses in a trash pile soon after she and I moved to New Orleans from Canada. She wanted to find out more about the seamstress and make a film about her. She received funding from the Rockefeller Foundation and continued to work on the film as a new mother and then after Hurricane Katrina, which ruined a lot of the material she had already filmed. 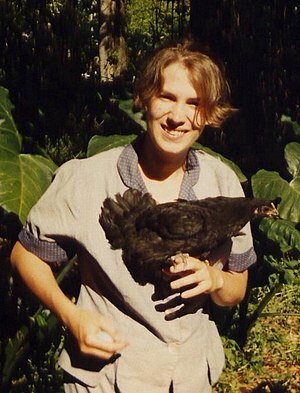 After Helen was murdered in January 2007, I decided that I wanted to finish the film that she devoted much of her energy to. I got an incredible amount of help and support from our friends and family, and I recently completed it as a 16 mm film print, which is how Helen liked to screen her films. 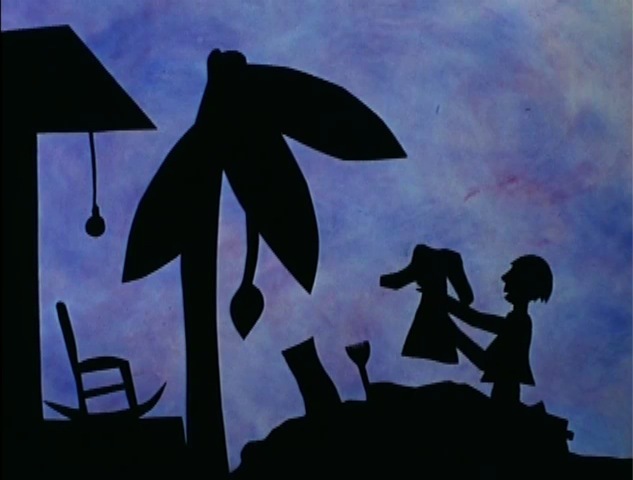 The final result is a 31 minute experimental documentary that includes Helen's beautiful silhouette and cut-out puppet animation, as well as re-printed flood-damaged home movies. Helen put a lot of love and energy into The Florestine Collection, and she was very determined to finish it. I am glad to at least be able to present my interpretation of Helen's vision for the film." It also showed recently at the Ann Arbor Film Festival. Thanks Paul. We all miss Helen, and we're all excited that you've helped interpret her vision and have completed this film. I hope many film festivals and exhibition venues book the film for further screenings soon.